Today in Ireland we celebrate the feast of Bl Margaret Ball and Bl Francis Taylor. These were two lay people who suffered and died for the Catholic Church in 1584 and 1621 respectively. At that time, England had just become a Protestant nation and was persecuting the Catholic faith at home and in those lands where it had control. Ireland was one such land. Margaret Ball was teaching the faith to children, she also used her house as a safe refuge for priests, who were on the run and forbidden to say Mass. For these ‘treacherous crimes’ Margaret was put in Dublin castle prison and the harsh, merciless conditions soon led to her death. Francis Taylor was elected Lord Mayor of Dublin in 1595. However, he would not deny his Catholic faith and in 1614 was also put in the Castle where for seven years he endured many hardships. All either of these people had to do to save their lives was to convert to Protestantism. But, like Margaret Ball, Taylor held out to the end, finally dying in 1621. 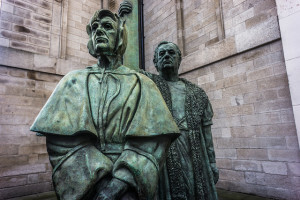 When Pope John Paul decided to honour the Irish lay people who had held on to the faith despite hardships and persecution, these two were picked to represent all those who had born witness to the faith. The Irish people have suffered a lot for the Catholic faith. Perhaps we are entering such a period again, when people shall be actively persecuted for being Catholic. It is not inconceivable and it may be what we have to go through for our country to recognise the pearl of great value upon which it turned its back. One thing you can be sure off, when the time comes God shall raise up men and women worthy of the faith and who will bear witness even at the cost of their lives.